Stoic Games have reached the end of a long and arduous journey; one that required the help of an army of crowdfunders , and contained a short intermission for some free-to-play battling . To celebrate the end of their adventure, here's a celebratory trailer. To be clear: their adventure is in the more metaphorical sense of the development and release of tactical-RPG The Banner Saga. As far as I know, they have not personally carried some giant axes through a harsh and mythical wilderness. 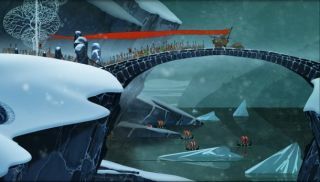 The Banner Saga will be available on Steam within the next couple of hours. The game is an RPG-style epic, in which you take your Viking clan on a lengthy journey, build and manage your caravan, and biff things with the aforementioned axes. As you might expect from former Bioware developers, narrative is a big focus. Your choices in conversation and combat promise to have a significant impact on the story.